In this wonderful etching, Whistler depicts a view of the river Thames showing the Hermitage Coal Wharf and other wharves in Wapping. On the left, the warehouses have signs which read “Fred Vink &Co / Rope & Sail Makers / Smith & Son / Hermitage Coal Wharf.”, hinting at the maritime industry. Down the shore on the right a warehouse sign reads “Hore’s Wharf.” This is a busy scene with several sailing ships and lighters. The Coal Wharf later became the Hermitage Steam Wharf, from where the London and Edinburgh Shipping Company ran regular services to Leith. Whistler turned to the subject of the Thames in the summer of 1859 and this work is among the earliest made of the river. 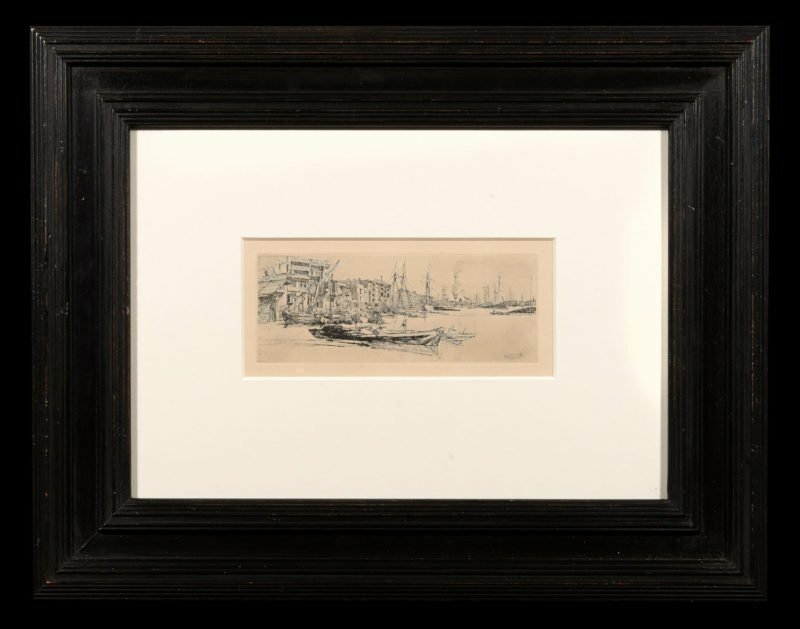 This print was published by Frederick Standridge Ellis in 1871 as part of Whistler’s ‘Series of Sixteen Etchings on the Thames’. Later impressions were made available through The Fine Art Society and the artist. He etched the plates after he had moved to Wapping in 1859. He worked directly with his subjects and by doing so, succeeded in highlighting the existence of a working-class maritime community in the city of London. In the two earliest plates, Old Westminster Bridge and Thames Warehouses, he adopted a long, narrow format, reminiscent of topographical prints. There is little modern about Old Westminster Bridge, but in Thames Warehouses the subject is brought closer to the viewer. It was the introduction of the figures of working men placed centrally in the foreground which first provided the formula for the arresting compositions of the series of etchings which followed. Born in 1834 in Lowell, Massachusetts to Irish and Scottish parents, Whistler became noted for his paintings of nocturnal London, his striking and stylistically advanced full-length portraits, and his brilliant etchings and lithographs. He is also famously known for changing the course of art history with his radical techniques and adoption of Asian design principles, which emphasized a two-dimensional flattening of painted forms and their arrangement into abstract patterns. Whistler embraced and promoted the theory that art should not serve narrative, but rather project the artist’s subjective feelings through the handling of the medium. His revolutionary methods changed existing approaches to oil paint, pastel, watercolour, and etching—even interior design and the decorative arts. His radical techniques altered how his contemporaries like Édouard Manet and Edgar Degas saw and understood art. His most famous painting Arrangement in Grey and Black, No. 1 scandalized Victorian London by suggesting the reduction of a portrait of his mother to an arrangement of formal elements. Kennedy, Edward G. The Etched Work of Whistler. San Francisco: Alan Wofsy Fine Arts, 1978. No.47.